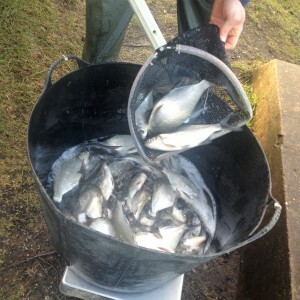 As many of you will be aware 2 years ago we unfortunately lost some of the Bream at Calfheath reservoir, however rest assured the management group are committed to ensure the fishing quality is maintained and there are plenty of fish present to be caught be all. 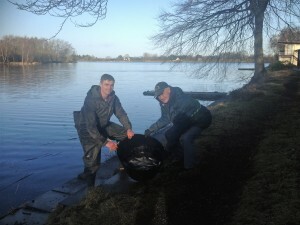 Last week we took delivery of another 2,600 bream that were around 8-10 inches in length, Priory Fisheries who have supplied most of our silver fish, once again came though with the goods and provided quality stock that will thrive at Calfheath. For anyone that’s not a mathematician that’s x5325 Bream, weighing 1,350lb stocked so far with another 2,600 & 800lb planned!! That will total x7,925 Bream, weighing 2,200lb…a serious amount of fish!! As you can see from the numbers above, there has been a significant amount of fish reintroduced into Calfheath and that’s not considering whats already in there, please rest assured that there is a healthy fish stock in Calfheath and the numbers will continue to increase in the near future! !